If You Ate at Chick-Fil-A Today, What Was Your Experience? One thing that made me sad was that there is no Chick-fil-A within hours of my house or we would have driven there for dinner. My heart is singing to see Americans support a good man, a good country, marriage and morality. If you went to Chick-fil-A today, what was your experience? We dont have one in our area either, but the pictures coming across my facebook newsfeed were awesome! 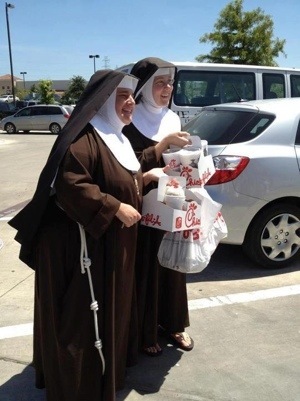 Lines all around their buildings, nuns, priests toting Chick-fil-a, exercising free speech! 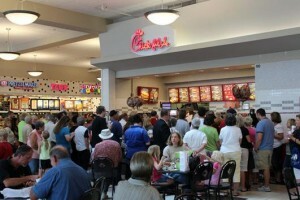 The Chick-fil-A at the university I work at was busy selling what meals they prepared quickly – had a waiting line…. Their meals are very tasty so I will happly continue having lunch there regularly. It was insanely busy! I have never seen a drive thru wrap twice around a fast food restaurant before. There was also a line of people GOING OUTSIDE THE BUILDING around 20 or 30 deep. Actually, it was so busy we decided to go to another one at the food court in the local mall, just one minute down the road. Guess what? That one was very busy as well. Our family ate at their and enjoyed every bite of our waffle fries and chicken. Political activism never tasted so good!! I tried earlier in the day (Overland Park, KS) and it was so busy I decided to come back because the police were directing traffic to park in an empty lot next to the restaurant. In the evening I returned to another Chick-Fil-A (Kansas City, MO), with my wife an 3 daughters, and again it was completely packed. There was one gentleman on the sidewalk with a sign saying that Chick-Fil-A discriminates. The drive thru line moved quickly and the food was pretty good. Our local 10:00 news had a lady (homo sexual) saying that she doesn’t think her money should go to a business, Chick-Fil-A, that she knows is in turn going to give it to an organization that she doesn’t agree with(traditional marriage). I thought that was interesting because, if I have my ducks in a row, that’s what we are saying i.e. planned parenthood or even the HHS mandate. Either way there were a lot of happy cows in Kansas and Missouri because chicken was the dinner of choice for thousands of people!!! !